FOR some days after Alagamma's samadhi people stayed close by. They had to fetch water from Paliteertham with great difficulty. Observing this, Bhagavan dug into the soil at a moist place and there was a spring. A larger pit was dug and enough water was obtained . This came to be known as Ramanateertham or aghasamanam. few speculated that it was for the convenience of the visitors who found it difficult to visit him and serve him atop the hill. But the real reason was quite different. Bhagavan himself said that one morning when he came out of Skandasramam some irresistible power dragged him down and that he came down even forgetting for the moment that back at Skandasramam the ashramites would be waiting for him at meal time. "Did I come here of my own volition? Not at all, it was due to the will of something else," said Bhagavan. Earlier, the power of Arunachala drew him to this place, now the power of Amba residing in Matrubhuteswara must have done similarly. Quite surprisingly, from that day on, the influence of that sakti became manifest in all activities. It was as if in the presence of Bhagavan that power acted just as prakriti [?] would in the presence of purusha! Its first job was to transform the face of the Ashram itself. but in 1924 two huts, one opposite the samadhi and the other to the north of that got erected. For bathing, the waters of Paliteertham and for pooja the waters of Ramanateertham were used. As for food, several devotees from the town came with offerings; in addition, some vessels were also donated to enable the Ashram to have a kitchen. People also donated money. Books like Ramana Geeta were sold at a book shop called Ramaneeya Granthalaya and the proceeds given to the Ashram. Dandapani and others utilised that money for buying vessels and food articles. No money could be saved. With all this, the Ashram did face difficulties. On any given day at least ten persons dined there. This practice gave ideas to a group of robbers. They thought that the Ashram was affluent; so on the night of June 26, 1924 they came for a robbery. Earlier also some robbers had entered the pooja room and decamped with whatever they could lay their hands on. But the present gang was made of sterner stuff. The Swami was resting in the hut opposite the samadhi and a few disciples rested near the windows of the hut. On hearing some noise, Kunjuswami and Mastan resting near the window woke up. They heard voices outside saying, "There are six people inside." "Who's, out there?," shouted Mastan. The response was a shattering sound of the window panes. The disciples were terrified and sought the safety of the Swami's proximity and went close to him. The objective of the robbers was to terrify them. The Maharshi was unmoved and unperturbed. Kunjuswami opened the door in the north and brought RamakrishnaSwami resting in the northern hut for help. With the opening of the doors, the dogs Jack and Karuppan rushed out and began barking . The thieves beat them up. Karuppan, already sick, returned to the hut, Jack ran away somewhere. Bhagavan and Kunjuswami said to the thieves, "
There is nothing much for you to take from here, you may as well come in and take whatever you wish." But the thieves did not want to do so, they began removing a window. Kunjuswami was a youth and was all excitement. He said that he would go out and beat up the thieves and started to move towards the southern door. Bhagavan prevented him saying, "They are carrying out their dharma. Let them do what they please. Our dharma [?] is to be tolerant and we should not leave it." Kunju was pacified. The increasing tolerance of the ashramites only spurred the thieves into further activity. To create the impression that they had firearms they blasted a fire cracker. The ashramites responded, "Do not mind Kunju's words, come in and take whatever you want." On getting to know the name of one of the inmates, the thieves threatened that they would harm Kunju. By then Kunju had left by the northern door to the town to fetch some help. Ramakrishna said to the thieves, "Why all this fuss? hesitate to do so but meanwhile Ramakrishna returned and warded off the blows with his hands. Slowly, he escorted the Maharshi to the northern hut. All the ashramites gathered there. The thieves ordered them to stay there and not stir out. The Swami replied, "The hall is yours now, do whatever you please." One of the thieves came back and demanded a lantern. At Bhagavan's behest, Ramakrishna provided one. A little later another fellow came and demanded the keys of the cupboard. But Kunju had taken the keys with him already which information was passed on to the thieves. Thereupon they broke open the cupboard. All that they could get were a razor, a few silver pooja items, a little rice and six rupees saved by Thangavelu. Naturally the thieves were disappointed and showed it; one of them raised a stick and threatening Bhagavan, said "Where have you kept all your money?" "We are poor sannyasis, we survive on what others give us. We never had any money at all," said Bhagavan. However much the thieves pressed, that was the only reply they could get. The thieves left disappointed. give up our sadhu-dharma. If you go there and hit someone may die in the fracas. People will blame us and rightly too. Those thieves are ignorant and do not know what they are doing whereas we who can discriminate between dharma [?] and adharma should not leave dharma. If by accident, the tongue gets bitten do you remove all the teeth?" So saying Bhagavan pacified Ramakrishna. By about two o'clock the thieves left the Ashram. Thereafter Bhagavan sat with his disciples, in the northern cottage and was discussing peacefully a Vedantic subject, as if nothing had happened till then. A little later, Kunju returned accompanied by the village `Maniam' (administrative official), Ramakrishna Iyer, and two police constables. The police made enquiries about the robbery. Very casually, Bhagavan replied "Some ignorant fools tried to rob the Ashram expecting a lot but returned disappointed, empty-handed". The police noted the statement and left. Munuswami, a boy who stayed at the Ashram ran behind the police and told them that the thieves beat up Bhagavan. `Maniam' also gave a statement at the police station. The following morning a group of police officials  the Deputy Superintendent, the Circle Inspector, the Sub Inspector and the Head Constable visited the Ashram to make enquires. Bhagavan did not tell anyone about the injuries inflicted on him. Neither then nor ever after did Bhagavan utter a single harsh word about the thieves. He never even recollected it. A few days later the thieves who were criminal tribals were caught along with the stolen articles and were sentenced to imprisonment. By 1926, a few more constructions took place. Along with this expansion squabbles arose among the disciples as to who should manage the affairs of the Ashram. How true it is to say that the desire to exercise power is as strong as the desire to earn money and have possessions. 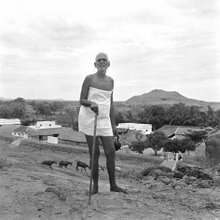 By 1930, a situation arose where nobody bothered about the impending Jayanthi of Bhagavan and doubts arose whether the Ashram would survive at all. A few disciples gathered and decided that Niranjanananda Swami should be the sarvadhikari (Chief Executive). But some others filed a suit in a court against this. To avoid further problems some devotees prevailed upon Bhagavan to execute a power-of-attorney in favour of Niranjanananda Swami and a will specifying how the management of the Ashram should be carried on. There was no dearth of people who were keen to cause problems for the Ashram even later . in 1930, the construction activity in the Ashram was spectacular. Several buildings like the office, the book depot, the store room, the dining hall, the guest room, the Veda pathasala, and the goshala were constructed the last named, largely because of Lakshmi the cow who became a sort of an adopted daughter of the Ashram. As time passed, facilities for visitors and inmates of the Ashram were added. Notable among these was the guest house built by the Raja of Morvi across the road opposite the Ashram. the west of the Ashram known as Palakothu. At Palakothu there was a perennial spring, the Agastyateertham. The entire family of Aurobindo Bose of Bangalore was devoted to Bhagavan. They settled down at Arunachala close to the Ashram. They acquired a large piece of land, built four cottages and named the compound as Mahasthana. Those cottages were meant chiefly for westeners who were finding it inconvenient to stay at the Ashram. Adjacent to Mahasthana three cottages were put up by McIver. Similarly, other compounds arose like the Chettiar compound and Gounder compound. Thus was formed Ramananagar. Maybe this was decided upon by Bhagavan much earlier. Both Chadwick an Englishman and Devaraja Mudaliar who were disciples of Bhagavan built rooms for themselves in the Ashram compound itself. Adjacent to their rooms Yogi Ramaiah and Subbarama Reddy constructed their rooms. All these four were close to the flower garden lying to the west of the hall where Bhagavan stayed. A dispensary also had come up to the north east of the flower garden to cater to the medical needs of visitors and Ashram inmates. Ashramites also spent substantial amounts in renovating Paliteertham and built steps to approach the waters. A library housing numerous volumes in various languages was also established. capital to start with. The amounts given unasked by visitors, and the amounts received by the sales of Ashram publications constituted the main sources. There were a number of devotees who served in the Ashram expecting no return. Actually, Ashram employees were few; the devotees got nothing in return but Bhagavan's grace. Work always would go on from four in the morning to about eleven in the night. With the passage of time, providing food for unexpected guests ceased to be a problem.